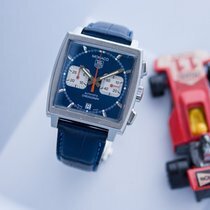 Tag Heuer Monaco Chronograph Steve McQueen Edition – Blue Dial – CW2113-0. 38mm solid stainless steel case with the electric sunburst blue dial with white chronograph sub-dials with red chronograph hands and large red seconds hand. The Tag Heuer Monaco was first introduced in 1969 to celebrate the Monaco Grand Prix. This watch was also the first ever chronograph watch to have a square shaped case. 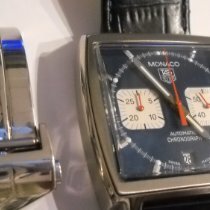 Steve McQueen wore a Monaco in the 1971 film “Le Mans”Although this watch was discontinued in the mid-70s, Then the Monaco was re-introduced in 1998 and was re-issued once again with completely new features in 2003.